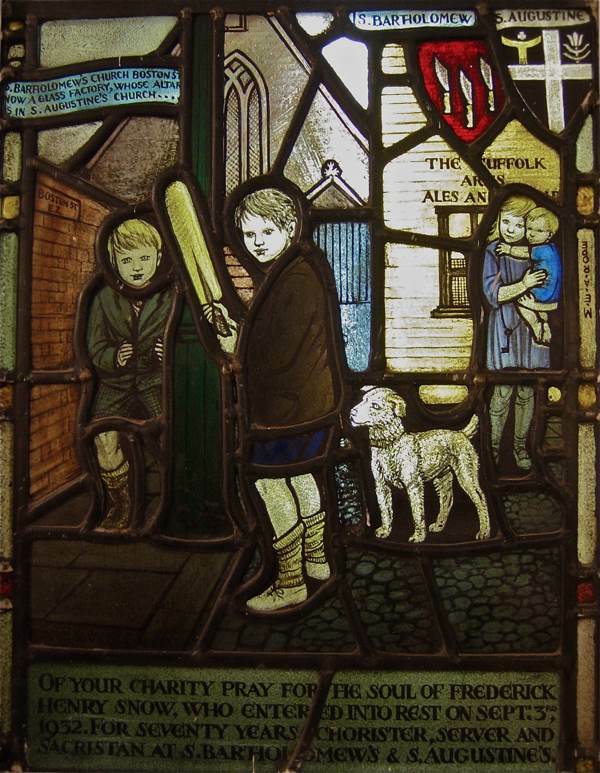 A familiar East End scene of 1933 – children playing cricket in the street and Nipper the dog joining in – yet it is transformed by the lyrical vision of the forgotten stained glass artist Margaret Rope, who created a whole sequence of these sublime works – now dispersed – depicting both saints of legend and residents of Haggerston with an equal religious intensity. This panel is surmounted by a portrayal of St Leonard, the sixth century French saint, outside a recognisable St Leonard’s church, Shoreditch, with a red number six London bus going past. Margaret Rope’s extraordinary work mixes the temporal and the spiritual, rendering scenes from religious iconography as literal action and transforming everyday life into revelations – describing a universe simultaneously magical and human. 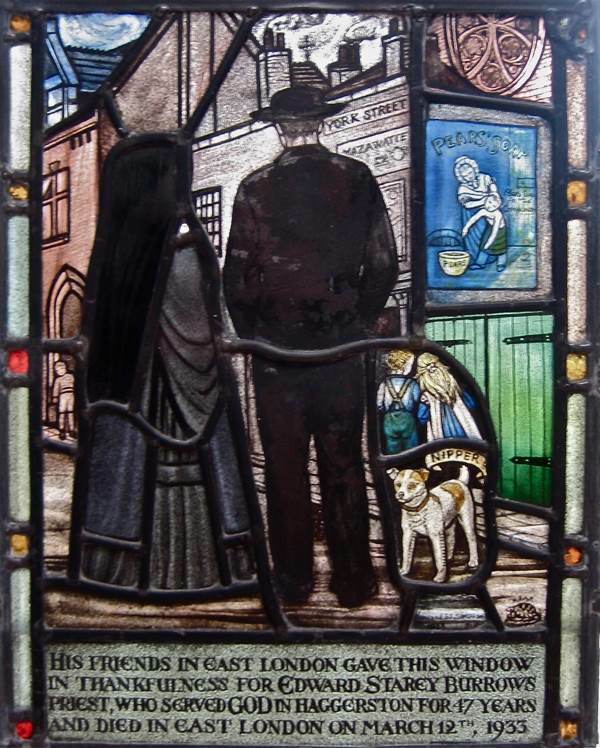 Between 1931 and 1947, the artist known simply to her family as ‘”Tor,” designed a series of eight windows depicting “East End Everyday Saints” for St Augustine’s church off the Hackney Rd, portraying miracles enacted within a recognisable East End environment. 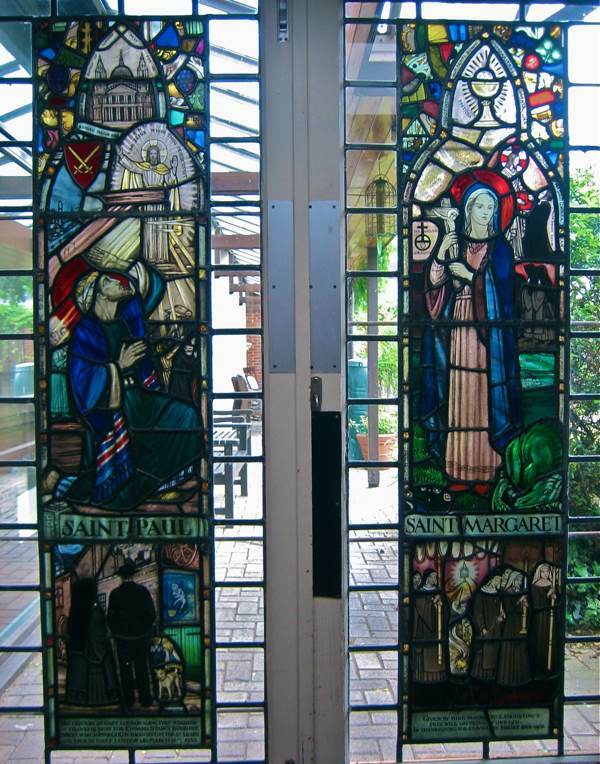 For many years these were a popular attraction, until St Augustine’s was closed and Margaret Rope’s windows removed in the nineteen-eighties, with two transferred across the road to St Saviour’s Priory in the Queensbridge Rd and the remaining six taken out of the East End to be installed in the crypt of St Mary Magdalene, Munster Sq. Intrigued by the attractive idea of Margaret Rope’s transcendent vision of the East End, I set out to find them for myself. At St Saviour’s Priory, Sister Elizabeth was eager to show me their cherished windows of St Paul and St Margaret, both glowing with lustrous colour and crammed with intricate detail. St Paul, the patron saint of London, is depicted at the moment of his transformative vision, beneath St Paul’s Cathedral – as if it were happening not on the road to Damascus but in Ludgate Circus. 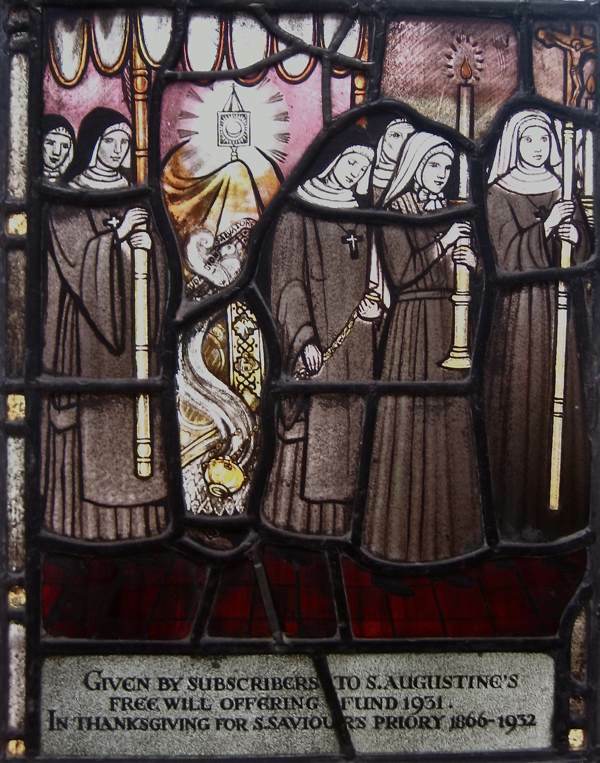 The other window, portraying St Margaret, has particular meaning for the sisters at St Saviours, because they are members of the Society of St Margaret, whose predecessors first came from Sussex to Spitalfields in 1866 to tend to the victims of cholera. In Margaret Rope’s window, St Margaret resolutely faces out a dragon while Christ hands a tiny version of the red brick priory to John Mason Neale, the priest who founded the order. Both windows are engaging exercises in magical thinking and the warmth of the colours, especially turquoise greens and soft pinks, delights the eye with its glimmering life. I found the other six windows in the crypt of St Mary Magdalene near Regents Park, now used as a seniors’ day centre, where they are illuminated from the reverse by fluorescent tubes. The first window you see as you walk in the door is St Anne, which contains an intimate scene of a mother and her two children, complete with a teddy bear lying on the floor and a tortoiseshell cat sleeping by the range. Next comes St George, who looks like a young athlete straight out of the Repton Boxing Club, followed by St Leonard, St Michael, then St Augustine and St Joseph. All share the same affectionate quality in their observation of human detail that sets them above mere decorative windows. 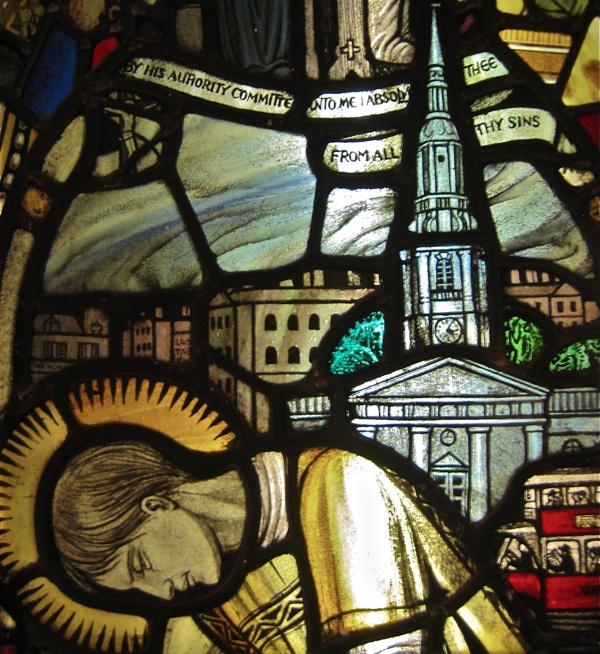 These are poems in stained glass manifesting the resilient spirit of the East End which endured World War II. 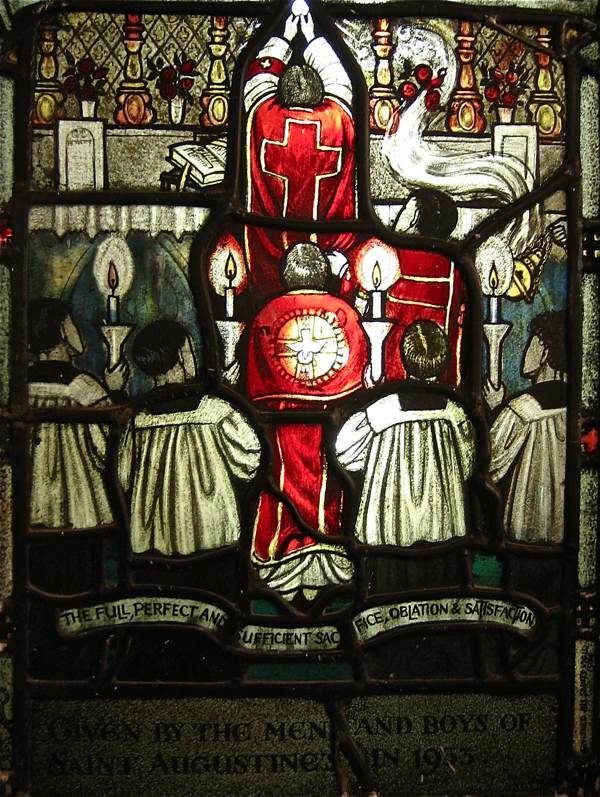 Another window by Margaret Rope in St Peters in the London Docks, completed in 1940, showed parishioners celebrating Midnight Mass at Christmas in a bomb shelter. Margaret Edith Aldrich Rope was born in 1891 into a farming family on the Suffolk coast at Leiston. Her uncle George was a Royal Academician, and she was able to study at Chelsea College of Art and Central School of Arts & Crafts, where she specialised in stained glass. Unmarried, she pursued a long and prolific working life, creating over one hundred windows in her fifty year career, taking time out to join the Women’s Land Army in World War I and to care for evacuees at a hospital in North Wales during World War II, before returning to her native Suffolk at the age of eighty-seven in 1978. 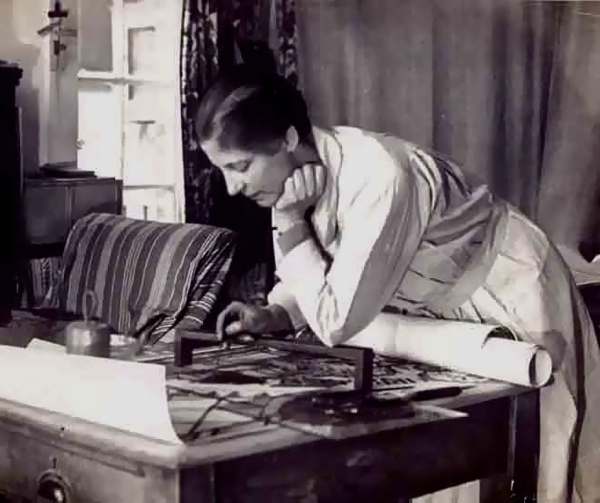 Her nickname “Tor” was short for tortoise and she signed all her works with a tortoise discreetly woven into the design. Upon close examination, every window reveals hidden texts inscribed in the richly coloured shadows. So much thought and imagination is evident in these modest works executed in the magical realist style. They transcend their period as neglected yet enduring masterpieces of stained glass and I recommend you make your own acquaintance with the stylish work of Margaret Rope, celebrating the miraculous quality of the everyday. Mother Kate, Prioress of St Saviour’s and Father Burrows with his dog, Nipper, standing outside St Augustine’s in York St, now Yorkton St. 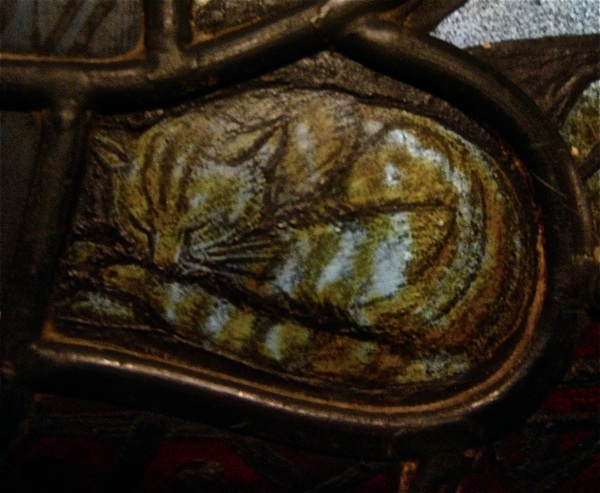 In the right hand corner you can see the tortoise motif that Margaret Rope used to sign all her works. Thank you for sharing these beautiful windows. Tor’s contemplative visions must have been deeply appreciated by many churchgoers who could identify with – and perhaps be inspired by? – the intermingling of familiar daily life with the spiritual. Good to ‘meet’ Margaret Rope; thanks, Gentle Author. A wonderful insight into the world of East End Anglo-Catholicism, at its zenith between the wars but still alive in churches such as St Anne’s and St Chad’s in Hoxton. These are very beautiful religious artworks and I will check them out when I get the opportunity. You find such diverse and engaging artworks in these pages Thank you. I never realised that magical realism was an art as well as a literary style. #something new everyday. A wonderful new-to-me discovery. 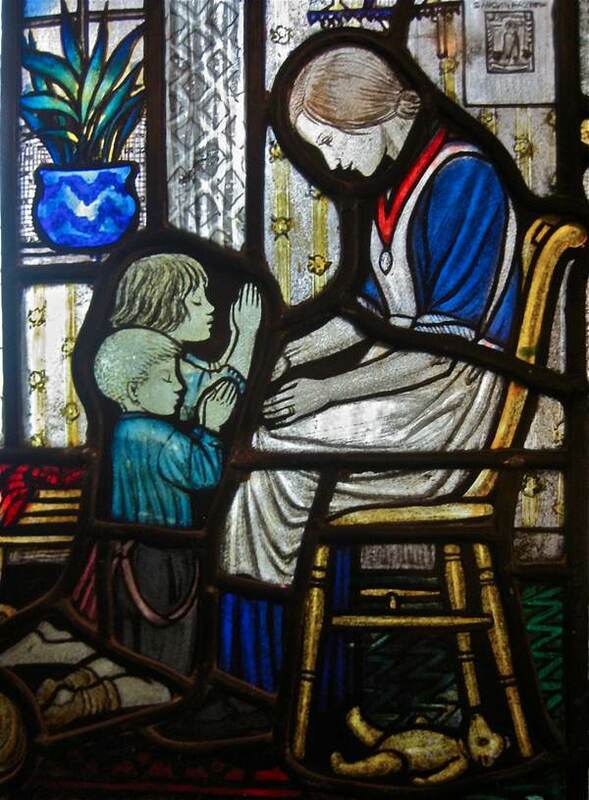 I love these luminous and comforting images of real life, offered in stained glass; and am so glad that they have been preserved and maintained. These are wonderful, thank you so much Gentle Author. I love all the domestic details, these windows are real source of wonder. Magnificent. I hope these are ‘very well protected’ against being damaged. Please remove from those doors, makes me cringe. I am now on a tortoise hunt. So enamored with this lovely art, I did a quick search a la Google and discovered that if you type Margaret Rope you quickly discover that her cousin by that name seems to be considered the more famous stained-glass artist. But isn’t it fascinating that two women in one family took up this art, and apparently did quite well in achieving success? The other Margaret, Margaret Agnes Rope, converted to Catholicism and lived out her days in a convent. One wonders if the two cousins corresponded about their art and if so, how that relationship affected the direction, content, and quality of each, if at all. Thank you! I’ve never heard of Margaret Rope. Her work is beautiful. You get a sense of what a ‘high Anglican’ church must have been like decades ago in the East End: camp, colourful, full of incense & repressed sexuality. Absolutely fantastic work. Is there any kind of book on “Tor” and her work ? In case anyone’s interested I’ve managed to pick up a book (unseen) and a few postcards via email from The Shrewsbury Museum , where there’s a show of Tor’s windows. I believe it closes Sunday Jan 15th. 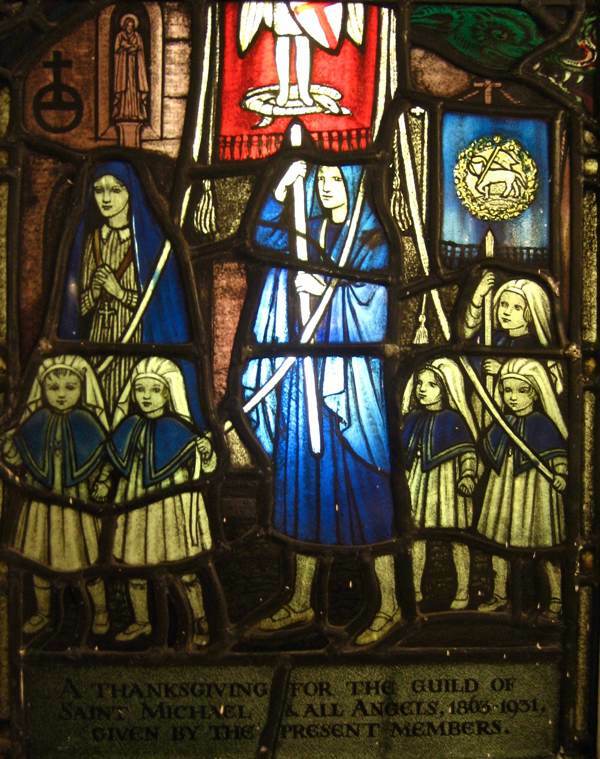 Interested readers can catch an exhibition devoted to the stained glass artist Margaret Agnes Rope if you’re quick. She was known as “Marga” the elder cousin of “Tor” featured in The Gentle Reader’s article. As to be expected with stained glass, her work which is very similar to Tor’s, is displayed by means of dvds as well as actual examples. Shrewsbury Museum and Art Gallery is located in The Music Hall which is situated in The Square, Shrewsbury. Opening Times – Open Tuesday-Saturday 10am to 4.30pm. The Visitor Information Centre closes at 4pm. Sunday opening hours are 11am to 4pm with last admissions at 3pm. PLEASE NOTE: We will be closed from Monday 16th to Tuesday 24th January so that essential work can be carried out. A revelation GA. Can I get to Shrewsbury? I agree with the comments about the Shrewsbury Margaret Rope. I had no idea she had a cousin in London, those pictures are wonderful & I’d love to see them. Here in Stoke we have always been heavily Nonconformist & apart from Bethesda & Stoke Minster there are few religious buildings that are worth much. So I’d like to explore that urban, working-class Anglo-Catholicism that is so fascinatingly alien to what I’ve known. It isn’t what “high church” conjures up in my mind and I’ve never seen anything like those windows so I’d love to see it. How fortunate that they were kept together in two groups and kept in churches. Such wonderful work. Beautiful work . Does anybody know what happened to Goddard and Gibbs on Kingsland Rd ( just a few yards before Shoreditch Church ) ? They made stained glass windows and you could do classes there . The building survives with the word ” Glass” etched into the masonary but the company has ” gone ” . Do you have any info GA ? Thanks for these beautiful pictures . Just come across these windows in Iain Sinclair’s latest book on London.